Hal Lindes, The American-English singer-songwriter and former guitarist with Dire Straits , Was Born 30 June 1953. Dire Straits were formed in 1977 by Brothers Mark (lead vocals and lead guitar)and David Knopfler (rhythm guitar and backing vocal), and friends John Illsley (bass guitar and backing vocals, and Pick Withers (drums and percussion), they recorded a five-song demo tape which included their future hit single, “Sultans of Swing”, as well as “Water of Love”, “Down to the Waterline”, “Wild West End” and David Knopfler’s “Sacred Loving”. Their sound drew from a variety of musical influences, including jazz, folk, blues, and came closest to beat music within the context of rock and roll. Despite the prominence of punk rock during the band’s early years, the band’s stripped-down sound contrasted with punk, demonstrating a more “rootsy” influence that emerged out of pub rock. 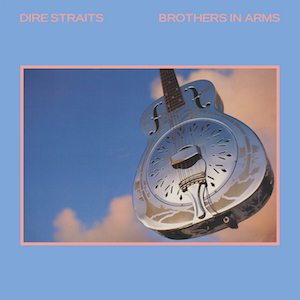 Many of Dire Straits’ compositions were melancholic and they have gone on to became one of the world’s most commercially successful bands, with worldwide album sales of over 120 million. making them One of the world’s best selling music artists, and their fifth album, Brothers in Arms, has won many accolades. In November 2009, Dire Straits were honoured by the new PRS for Music Heritage Award. A special blue plaque was erected at Farrer House, Church Street, Deptford in south London, where the original group, Mark Knopfler, David Knopfler, John Illsley and Pick Withers once shared a council flat and performed their first ever gig in 1977. PRS for Music has set up the Heritage Award to recognise the unusual “performance birthplaces” of famous bands and artists. Dire Straits have also won numerous music awards during their career, including four Grammy Awards, three Brit Awards—winning Best British Group twice, and two MTV Video Music Awards. The band’ most popular songs include “Sultans of Swing”, “Romeo and Juliet”, “Tunnel of Love”, “Private Investigations” .Dire Straits’ career spanned 18 years. Mark Knopfler and John Illsley were the only two original bandmates who remained until Dire Straits disbanded in 1995.